Teaching yoga is an art fuelled by authenticity and creativity. Your personal practice and understandings that follow from that spark your inner teacher and sharing with others will come naturally and spontaneously. Parimukti acknowledges and emphasizes that every student and teacher has his or her own unique presence, energy, and teaching style. We provide an environment for your learning and practice process, where yoga will be presented and practiced in depth. In our teacher training programs, we proceed from investigating the physical and energetic body to the mind. We gain clarity about how we perceive ourselves, others and the world around us by doing asana, pranayama, meditation, contemplation and sharing. 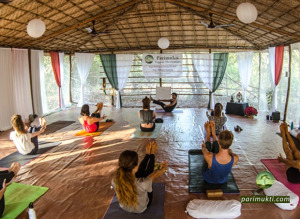 Parimukti 200 hours Teacher Training, together with the Parimukti 300 hours Teacher Training is what gives you the foundational ground, connection and steadiness, enabling you to explore the endless possibilities of life. In our Yoga Therapy Training you will learn how to use yoga and meditation in an individual therapeutical setting.